Also known as Castle City, or just referred to simply as “Castle,” this old mining camp, located just south of White Sulphur Springs, was once bustling with some 2,000 residents including the infamous Old West character of Calamity Jane. The camp got its start around 1882 when a prospector named Hanson Barnes found silver in the area. The first mine built was the North Carolina Mine in 1884, though almost 1000 claims were filed and the area was dotted with small operations. Its richest producer was the Cumberland Mine, which began mining for lead in 1884. Before long, the company was employing numerous miners and the town boomed. The camp soon boasted some 2,000 residents, a fine school, numerous merchants, several fraternal organizations, a jail, 7 brothels, and as many as 14 saloons. Into this atmosphere came Martha Jane Cannary, better known as Calamity Jane. After having lived a “wildlife” in the boomtown of Deadwood, South Dakota for several years, she tried for a short time to live an “honest” life running a restaurant in Castle City. But, this venture would prove to be short-lived and she soon returned to Deadwood. Castle’s major problem; however, was a lack of transportation, which required that all ore and supplies be hauled in and out by the wagon load. The rich ore was first hauled to the Yellowstone Mine’s Smelter, more than 100 miles to the south. The smelting problem was solved when the Cumberland Mine built its own smelter in 1891 and the operation quickly became the largest lead producer in the state. The smelter solved part of the problem, but the processed ore still had to be hauled out by the wagon load and mine owners were working desperately to get a spur to the town from the Montana Railroad. However, the Silver Panic of 1893 delayed the railroad and many miners began to leave. When the price of lead also dropped, the mine closed and the camp became a ghost town. Though there were short revivals in working the tailings and some of the underground shafts over the next several decades, none of the efforts was ever enough to revive the town. The last permanent residents left in the late 1930s, leaving the buildings to Mother Nature. 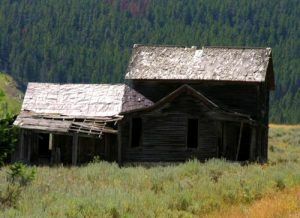 Today, the old mining camp is a classic ghost town with several buildings still standing including cabins, a couple of businesses, the school, and stone foundations. The camp is located on private land, and close inspection of the property requires permission. However, a public road runs near the town which provides a number of nice views. The old camp is located off of Highway 294 between White Sulphur Springs and Martinsdale, Montana. © Kathy Weiser/Legends of America, updated January 2018. I would like to view Castle town. How could I get special permission to see it?